Bob's Oil Well Greenville, Texas native Luther Bedford "Bob" Robertson (1894-1947), a veteran of World War I, came to Matador in the 1920s. He was a gas station attendant in 1932 when he decided to open a service station here. To promote his new business, he built a wooden oil derrick over the station. He patented his design, and in 1939 replaced the wooden derrick with one of steel that reached 84 feet in height and included lights. 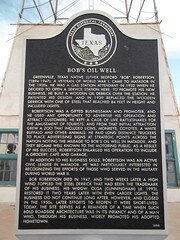 Robertson was a gifted businessman and promoter, and he used any opportunity to advertise his operation and attract customers. He kept a cage of live rattlesnakes for the amusement of tourists, and from that initial attraction grew a zoo that included lions, monkeys, coyotes, a white buffalo and other animals. 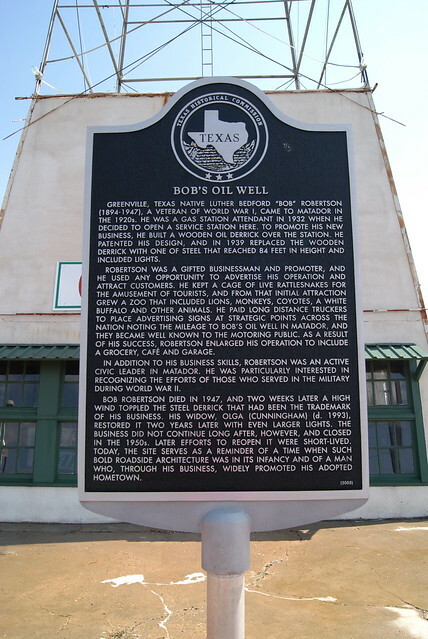 He paid long distance truckers to place advertising signs at strategic points across the nation noting the mileage to Bob's Oil Well in Matador, and they became well known to the motoring public. As a result of his success, Robertson enlarged his operation to include a grocery, cafe and garage. In addition to his business skills, Robertson was an active civic leader in Matador. He was particularly interested in recognizing the efforts of those who served in the military during World War II. 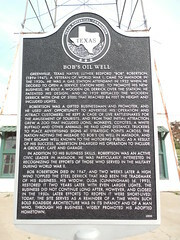 Bob Robertson died in 1947, and two weeks later a high wind toppled the steel derrick that had been the trademark of his business. His widow, Olga (Cunningham) (d. 1993), restored it two years later with even larger lights. The business did not continue long after, however, and closed in the 1950s. Later efforts to repoen it were short-lived. Today, the site serves as a reminder of a time when such bold roadside architecture was in its infancy and of a man who, through his business, widely promoted his adopted hometown.